As part of the Apps For Children With Special Needs iPads in Fifty States initiative, Artgig Studio has now discounted the Shake-a-Phrase iOS app by 50 percent as of today up until Sunday the 2nd of October and is to donate half of the sale proceeds to A4CWSN for this worthy cause. The Shake-a-Phrase app for the iPhone and Apple iPad is a storytelling educational application that combines hilariously generated sentences with physical device shaking in a game for children of eight and up. The Shake-a-Phrase application actively engages kids in building vocabulary and reading as they play and the “Quiz Me” game strengthens their understanding of speech, and there is a Story Starter mode that gets the user to set up silly scenarios and encourages your child to imagine what happens next. 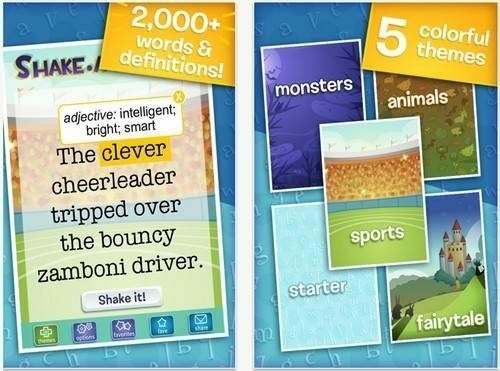 The Shake-a-Phrase iOS app delivers 5 content flavours that customise learning, starter, monster, fairytale, animal and a new sports theme including dictionary, while the vocabulary lists features in excess of 2000 words that have been compiled by parents and teachers. With the Shake-a-Phrase app you can discover the meanings of unfamiliar words, create your own writing projects, share language arts fun with friends and save the most hilarious sentences to your Faves Library. Thus as of today you can pick up the Shake-a-Phrase app from iTunes and at 50 percent discount at a cost of just $0.99 rather than the usual $1.99.